The 2009 January/ February issue of “Piecework” magazine has some fun articles in it. It has one on knitting two socks at one, one inside the other. Just like how Anna Makarovna in the book “War and Piece” knit socks. I practiced doing that after I bought the book based on Beverly Royce’s notes. If you can find a copy of the book it is well worth reading. I think it is called “Notes on Double Knitting”. There are other interesting articles in the magazine. Another one that caught my attention is about Andean knitting. My older sister spent 18 months living in the mountains with the indigenous people. She sent us a couple of things. 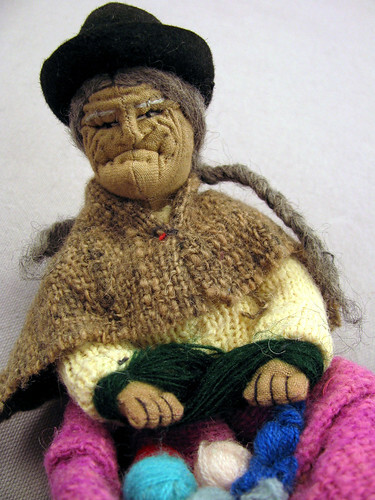 One is this little knitting doll I have named Dolores. I know these are made for tourists to take home. You can tell she is Bolivian by her bowler hat. All her clothing is hand made with handwoven cloth. Her little sweater is hand-knit and has a cable up the front. The most striking feature is the wrinkles stitched into her face. She is a work of art in a way. Someone took great pains to make her. She is just a tourist trinket, but she will always be special to me. This entry was posted on Friday, January 9th, 2009 at 3:00 am and is filed under Craft and Knitting. Tagged: Craft, Knitting. You can feed this entry. You can leave a response, or trackback from your own site.